The record attempt took place on the track at VC Darmstadt 1899, Germany. A 26" cycle without modifications was used. 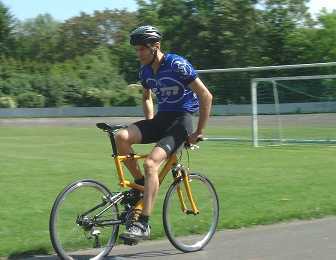 Markus Riese from Darmstadt, Germany (aged 35) trained 3 months before the record attempt. Saturday, 7 September 2002, on the track of the skeeler club Oost-Veluwe in NL-Heerde, Pieter de Hart (52) became the world fastest backwards biker. 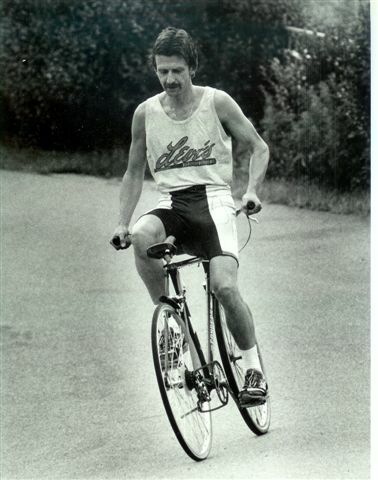 This title was given to him because of his respectful one hour world record backwards biking of 26.948 kilometres [16.7 mi] (The old record was 25.6 km [15.9 mi]) and his rather impressive 50 kilometres word record backwards biking of 2:00:08 hours (The old record was 2:52:11 hrs). Two record attempts in one event appeared to be more difficult than was expected on beforehand. The efforts for very steady lap times (between 44 and 46 seconds per lap of 336.5 m.) in the first hour took its toll in the second hour. Although the lap times showed again a steady performance (between 48 and some more than 51 seconds), the level on which it took place was not one of really top speed. However, the 50 kilometres world record backwards biking may be amazing, the surprise was not just in that result. 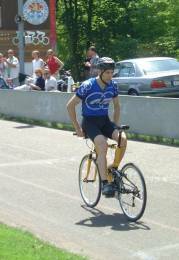 Already on beforehand De Hart, who has been active in backwards biking for more than a decade, predicted a time of approx. two hours. His prediction for the one hour World record backwards biking was a most-carefully one: Depending on the weather (a dry track) a record of about 26 km could be set. But already in the first twenty spectacularly minutes of the attempt is was very obvious that the scheme needed a positive re-adjustment. The reason: dry weather plus nearly no wind, together with the iron condition of the biker. And the last as the result of one to two hours training every day for the past months, De Hart said. More and more the wind became an important factor during the attempt. But, the basis for success was already realised in the very strong opening of the attempt: 22 minutes for 10 kilometres and 44 minutes for 20 kilometres! De Hart afterwards: In spite of the enormous efforts it was exiting to pass the finish line knowing to be the number ONE again after 12 years. In 1990, he was the world first to create the one hour World record in this discipline with 22.6 km. 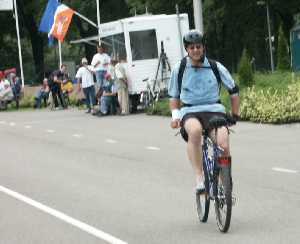 Backwards biking takes place on a regular bicycle - the record attempt of 7 September 2002 was made on a mountain bike- without the help of any additional aids or appliances: no mirrors, no special adaptations! The rider sits on the handlebars instead of the saddle, facing backwards, and peddling and steering in reverse. see also Arnold's web site.